On Tuesday the skies were so clear I made a point of visiting the hills. Not as clear as Monday, but from the top of Radio Tower Hill this is how the Golden Gate looked. Remember this when the weather is dismal. Click the photo for a 1000-pixel version. That’s the Farallon Islands on the horizon, perched at the edge of the continental shelf on the Pacific plate. They consist of the same granite found on Point Reyes, Bodega Head, Montara Mountain and points south in the Salinian terrane. The blob just below them is a freighter bound for the Port of Oakland, or perhaps a tanker bound for Point Richmond. 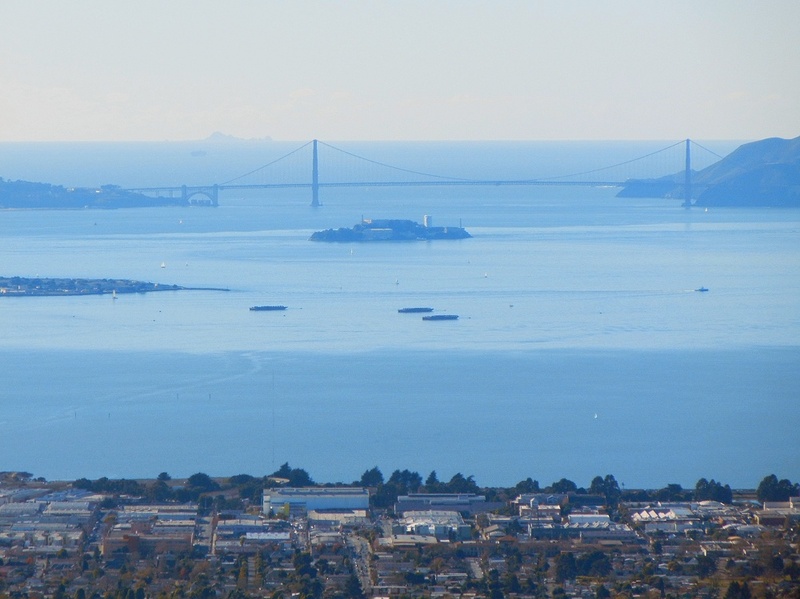 Downward in the image is the bridge, Alcatraz Island, Treasure Island and the foot of Ashby Avenue in Berkeley. Radio Tower Hill doesn’t really have a name. It’s the hill at the intersection of Grizzly Peak Boulevard and Marlborough Terrace. It’s made of Claremont chert. This entry was posted on 20 January 2012 at 9:24 pm and is filed under Oakland geology views. You can follow any responses to this entry through the RSS 2.0 feed. You can skip to the end and leave a response. Pinging is currently not allowed. Incredible view. I don’t think I’ve eve seen the Farallons from the East Bay. Thanks.